42" tall, basic electric fence for containing and controlling the movement of chickens, ducks and other poultry. Same mesh design as PoultryNet 12/42/3, but with 1/10 the conductivity. As such, Chicken Net is not advised for fences longer than 500 ft.
12 yellow horizontal twines (11 conductive) intersect with string verticals every 3". White line posts are spaced every 13'5". For fences that involve curves, corners and directional change, or when aesthetics are a concern, purchase additional line posts to reduce sag. Recommended for containing heavy, non-flying birds (e.g. Orpingtons and Wyandottes). 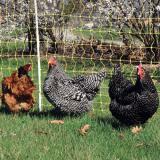 For flightier breeds and protection from larger predators such as coyotes and dogs, look to 48" Chicken Net. Arrives to your door as a complete roll with the line posts already built in. 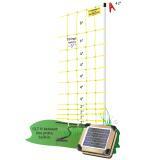 Just attach a fence energizer and it’s ready to keep poultry in and their ground-based predators out. Prevent raccoons, opossums, skunks, foxes and other predators from killing poultry. Chicken Net is not effective with baby chicks that are small enough to crawl through the net openings and therefore are not deterred by the electric shock. We’re aware that the lower price of Chicken Net encourages folks to choose this version. Think carefully before you do so. 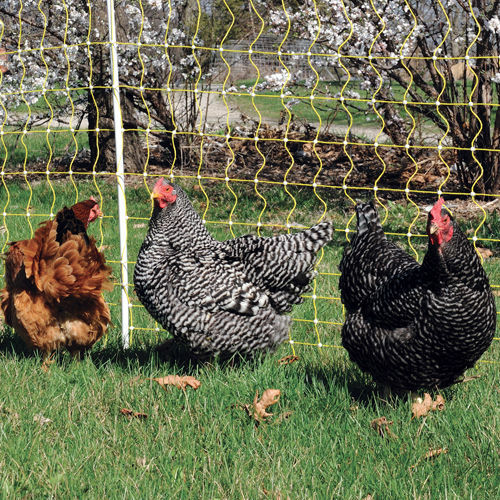 Customers who are unhappy with netting are often those who’ve chosen Chicken Net or its farmstore equivalents. Why do we offer it? Because it is similar in specifications to nets from other sources—and comparisons make decisions easier. 1/10 the conductivity of our premium nets, so it’s less suited for long fences. Not as easy to handle during removal and installation. The longer length between posts means more material to fold/roll. It’s also more apt to sag in uneven terrain. Yellow color is not as visible to animals (or humans) in low-light situations as compared to white/black fencing.